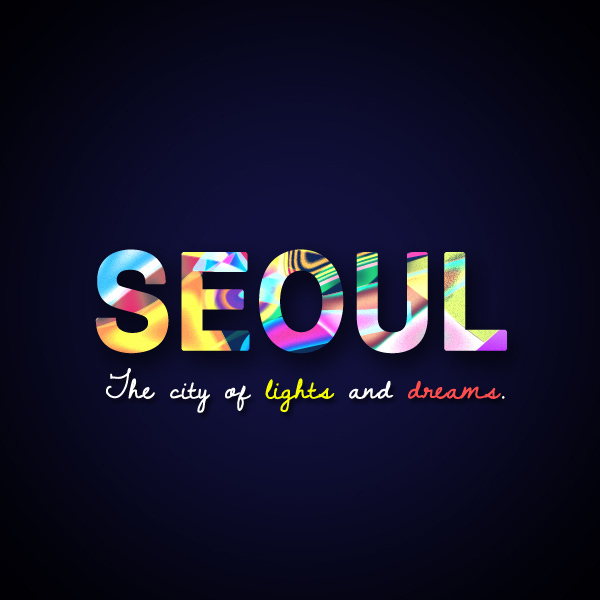 Seoul, it’s people, it’s culture, and it’s soul. 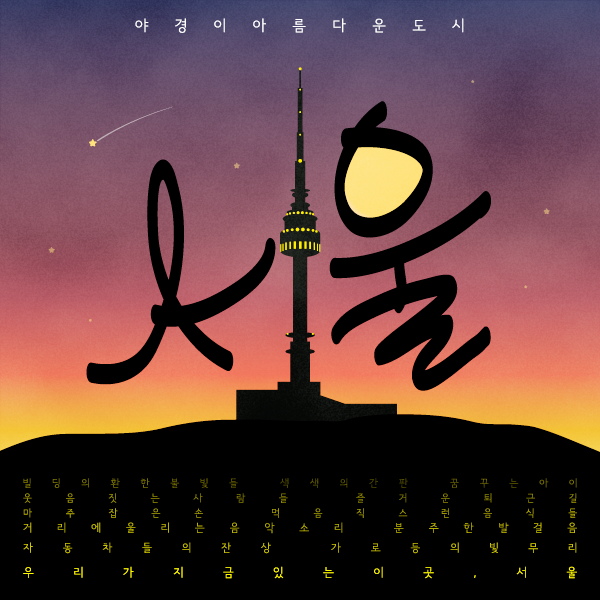 제가 생각하는 서울의 가장 서울답고 아름다운 모습은 바로 야경이라고 생각하기에, 서울 도시의 야경을 디자인으로 표현하고자 했습니다. 서울의 랜드마크인 남산타워의 실루엣을 메인으로, 캘리그라피를 조합해 ‘서울’이라는 단어가 되도록 하였습니다. 경쾌하면서도 세련된 서울의 느낌을 글씨체에 담고자 했습니다. 남산 아래의 도시 불빛들은 일정한 간격으로 나열된 자잘한 타이포로 표현했으며, 타이포의 내용은 제가 생각하는 서울의 이미지들을 단어로 기록했습니다. 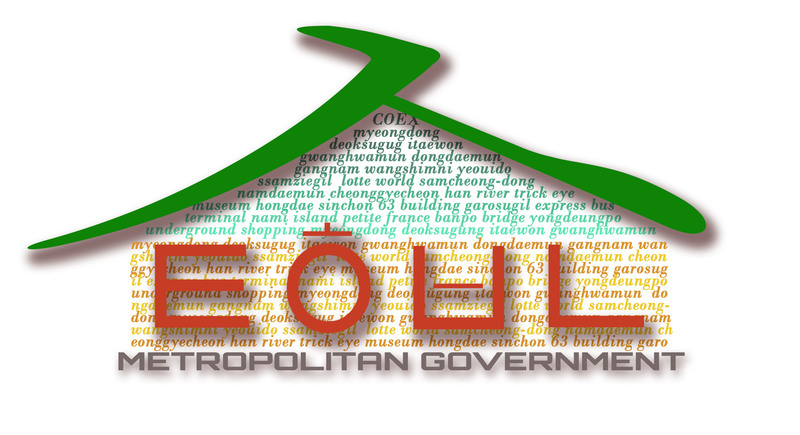 Seoul is the capital city of Korea. 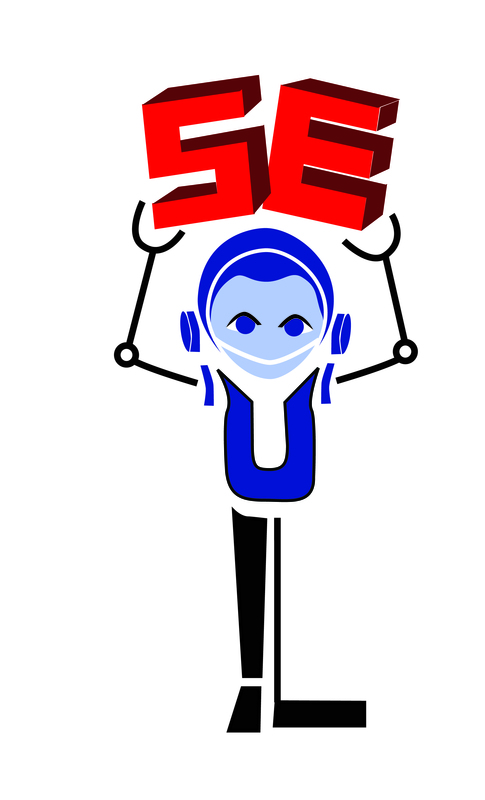 It is where all the great opportunity and experience begin. 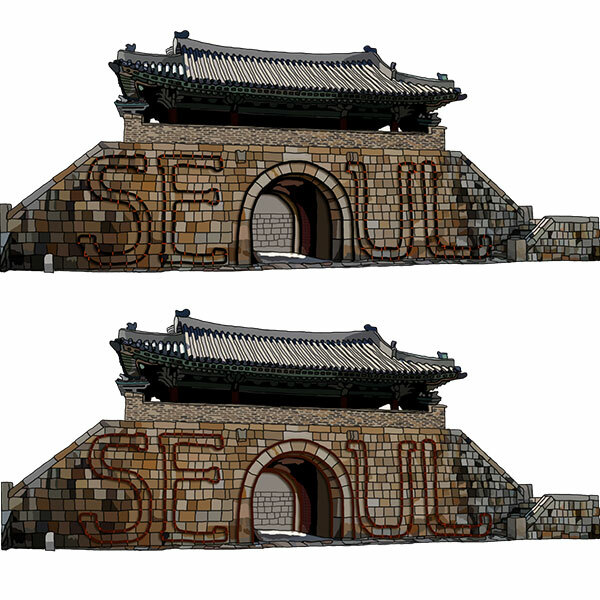 I tried making the letter ‘O’ in Seoul as a door for everyone. 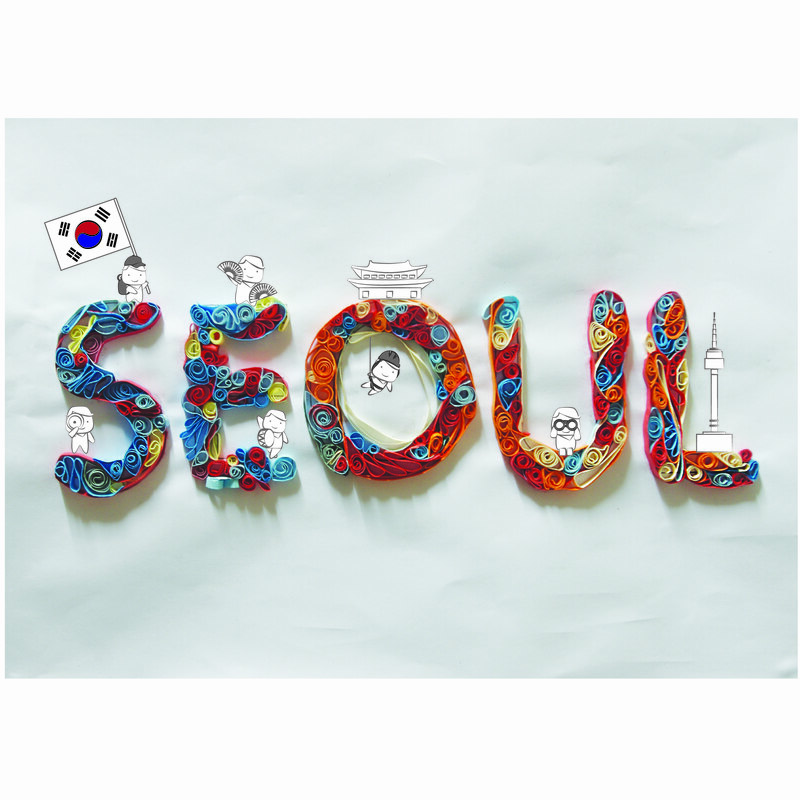 Seoul opens door for the domestic Koreans, the tourists, and all people all over the world who are interested in Seoul and Korea. 서울의 경복궁, 은행나무, 까치, 개나리, 한강다리, 버스 등을 사용하여 서울의 슬로건 ‘함께서울’을 나타내었다. 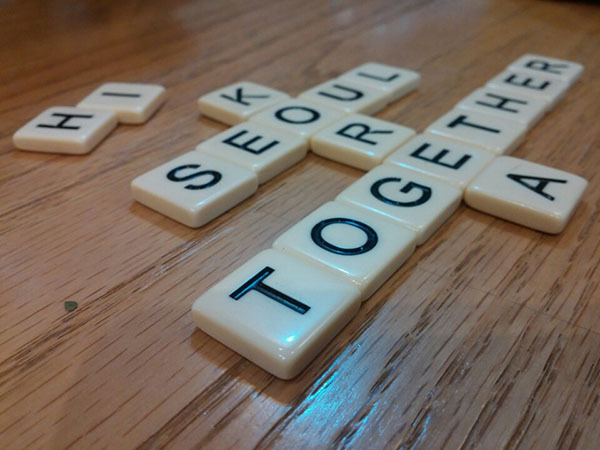 It’s been freezing cold in Seoul, but it is fun and beautiful season. 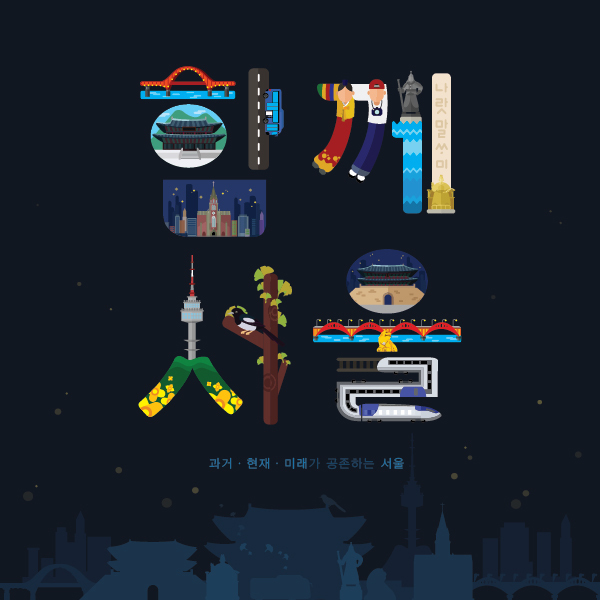 I tried to express the winter atmosphere with some official color of Seoul, Seoul Blue, White and Light gray. 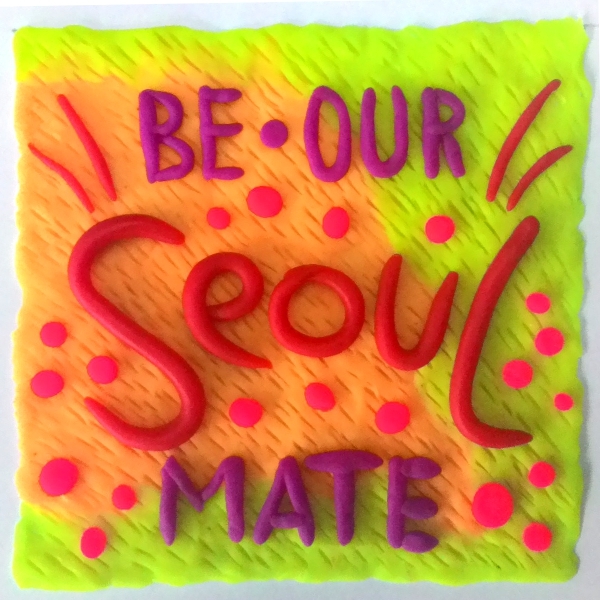 Seoul written in clay, featuring love and yinyang.